Whether you’re looking for a meal or a party appetizer, these Spicy Thai Chicken Drumsticks will satisfy your craving. A little bit of spice and a little bit of citrus helps balance out these chicken drumsticks, making them a surefire crowd pleaser. Whether you’re married or living with a friend or roommate, you know that you have to make lots of adjustments when it comes to living with someone new. But perhaps one of the most difficult is learning to share your food. At least with a roommate, you can usually have “mine” and “yours” sides of the fridge and you won’t be ridiculed for writing your name on your expensive yogurt. However, if I set up “hers” and “his” sections of my fridge and freezer, not only would that be very strange, but I don’t even want to know what my husband’s side would look like (have I told you what he had in his fridge when I met him?? You don’t want to know). Maybe I’m too food-focused in life, but there are days when I literally think about a specific food I have waiting for me at home every hour on the hour. On the train to work. In the middle of a meeting. As I’m drafting an email. On my afternoon walk. Thinking about that food gets me through the day. So, when I get home and open the cabinet/fridge/freezer to finally reward myself for a hard day’s work and find said food missing (let’s be honest, it’s almost always cookies or ice cream), my heart sinks and I want to curl up in a ball and cry. Clearly, I cope well. I’ve learned that I just have to ask my husband to please save me at least one of whatever I’m craving (and if he does happen to eat all of the ice cream to pleaseeee throw away the box so that I don’t get my hopes up sky high before picking up an empty box). And he usually does. In turn, I make him many of his favorite foods… For sharing, of course. This time I made Spicy Thai Chicken Drumsticks, garlic bread, and Skinny Cow ice cream for dessert. If only I had added in a side of corn dogs and giant glass of Mountain Dew (hint: this is what he had in his fridge when I first met him), it would be his ideal meal. Chris loves drumsticks and I hardly ever make them. He also loves spicy, which is never a problem for me. These spicy Thai drumsticks are super easy and you can prep them early in the day for a delicious dinner in no time at all. 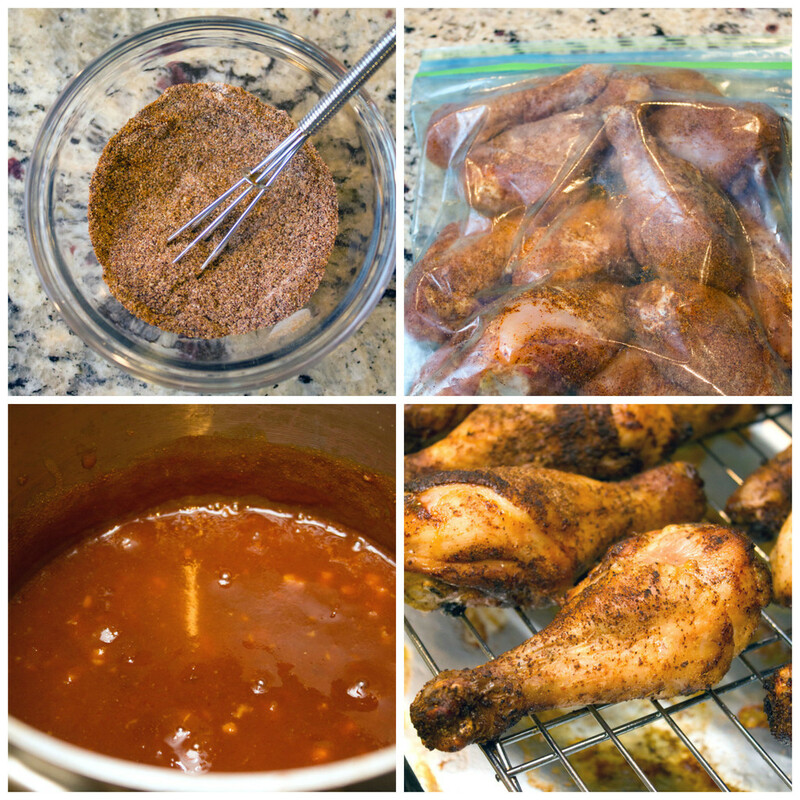 I let the drumsticks chill in the fridge with a spicy rub for a few hours. Yes, Winnie pup also thought it would be her ideal meal. Sorry Winnie… These are a bit too spicy for you. After they marinated in the rub, I baked them, and then coated them in super spicy sauce that involved Frank’s Red Hot sauce, Thai chili peppers, and Sriracha. 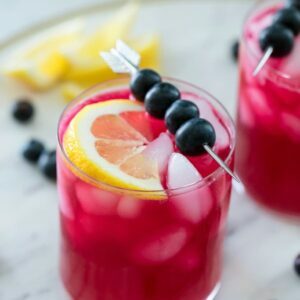 No Mountain Dew, but I did serve the meal with a large glass of berry juice, which is another thing he can’t get enough of. And plenty of garlic bread. I use Ina Garten’s recipe and think it’s just the best. Drumsticks, garlic bread, and ice cream… Can you really go wrong with that combo? The chicken drumsticks were super spicy, but not so much that I couldn’t handle them. I love spicy, but there’s definitely a level where it’s just not enjoyable for me anymore. Chris doesn’t have that level. I don’t know how he does it. And they were certainly at the spiciness level that ice cream was very much required at the end of the meal. Not only do these make a delicious dinner when served with a side or two, but they’re also a fabulous appetizer and great for parties. Just make sure you remind your guests they’re Thai chicken drumsticks and a little bit spicy! 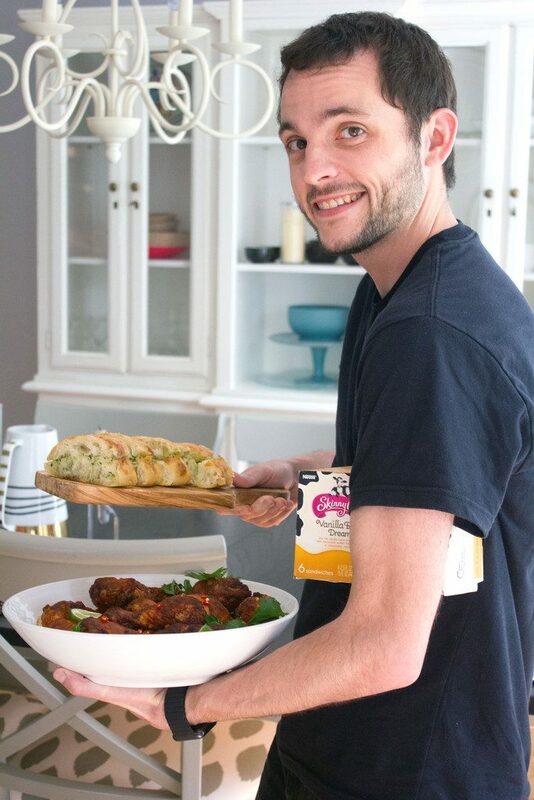 I nicely asked Chris to save me some food… But when I came downstairs, he was attempting to sneak away with it all. I thought I could trust him, but when it comes to a meal like this, I don’t really blame him for not wanting to share it. Don’t worry… I managed to catch him and snag a drumstick or two and an ice cream sandwich. Does your significant other or roommate “steal” any of your food? If you’re looking for more delicious chicken recipes, check out this Chipotle Chicken with Cashews or this Instant Pot Buffalo Chicken Pasta. Whether you're looking for a meal or a party appetizer, these Spicy Thai Chicken Drumsticks will satisfy your craving. 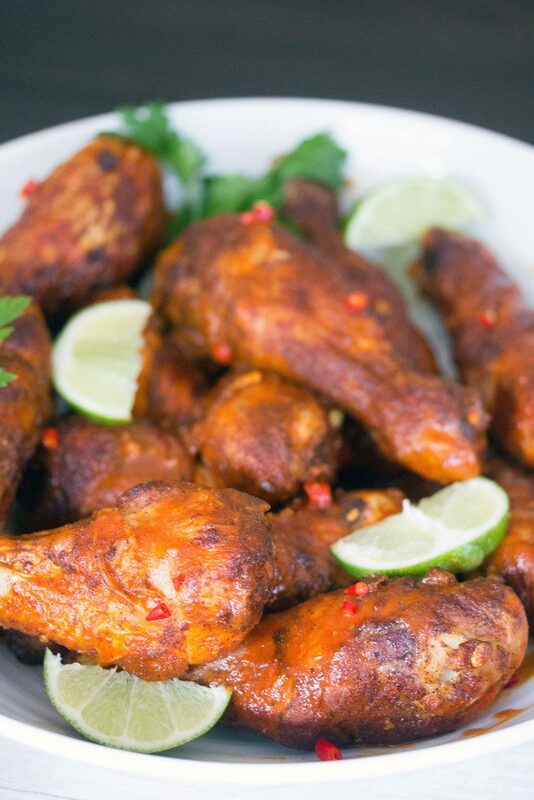 A little bit of spice and a little bit of citrus helps balance out these drumsticks, making them a surefire crowd pleaser. In a small bowl, mix together chili powder, garlic powder, baking powder, paprika, cayenne, and salt. 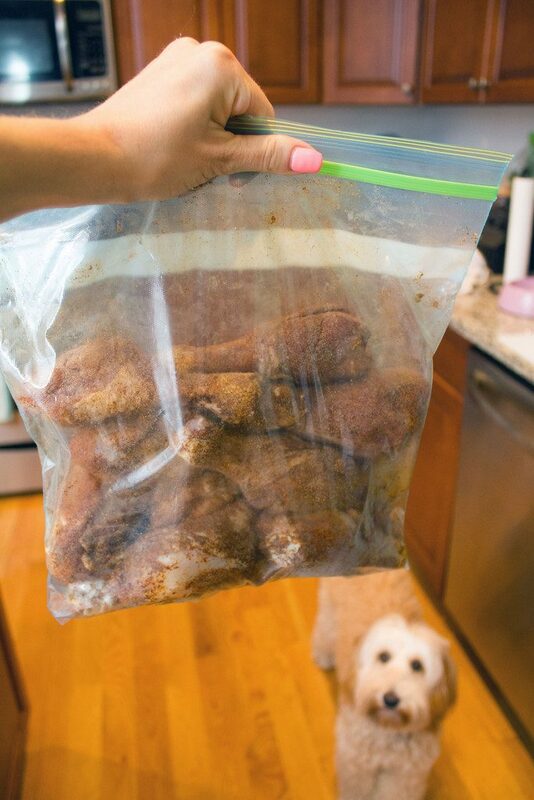 Place chicken drumsticks in bag and sprinkle seasoning to cover chicken. Place in fridge for at least 3 hours to and up to overnight. Place drumsticks on a wire rack set over a foil-covered baking sheet. 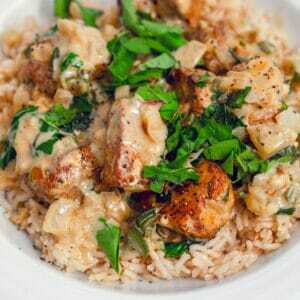 Bake at 450 degrees for about 40 minutes, or until chicken reaches internal temperature of 160 degrees. When chicken is almost done baking baking combine butter, Frank's Red Hot, Sriracha, Soy Sauce, chopped Thai peppers, minced garlic, and lime juice in a medium-sized saucepan over medium-high heat. Bring sauce to a simmer for about 3-4 minutes and stir until thickened. Place drumsticks in a bowl and pour sauce over the top. Toss to coat. 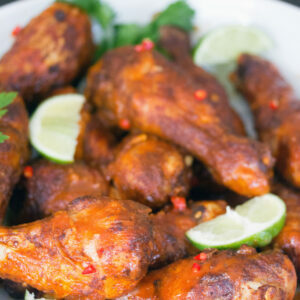 10 Responses to "Spicy Thai Chicken Drumsticks"
These wings look to die for!! They look absolutely divine! I wish i could grab one from inside the screen! In fairness I think I’ve had maybe 3 Mountain Dews in the last 9 years. I really wish I had some more of these wings right now. 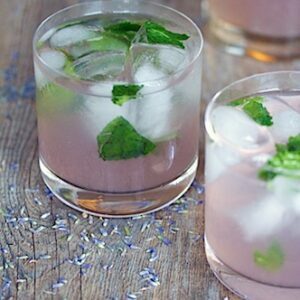 I realize it’s 7:30 in the morning but I could have this for breakfast… Right? OMG these drumsticks look incredible! And those skinnycow ice creams are a fave in our household, they’re so good! Lol, umm I can’t imagine what a ‘his’ and ‘hers’ side of our fridge would look like either. His side would be bare.. that much I know. And he would just steal stuff from my side. 😉 Anyways, LOVE these drumsticks, girlfriend!! Spicy thai?! YESSSSS! Seriously, I want to eat a few pounds of these pronto! Cheers! Now that is what I call the perfect meal! 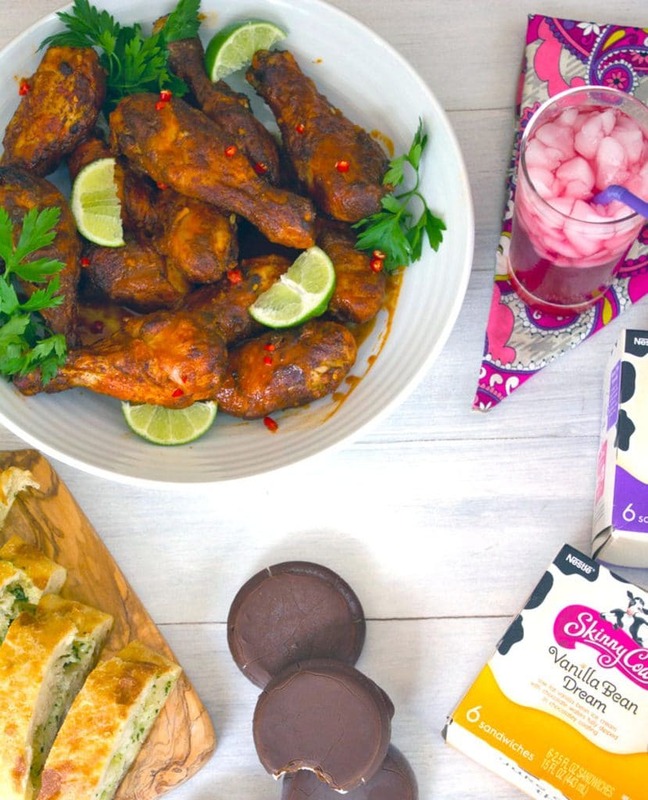 I love that you started with spicy chicken drumsticks and ended with refreshing skinny cow ice cream sandwiches. 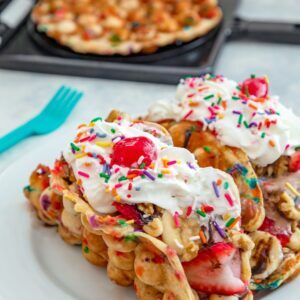 I definitely need to try them because they seem like the perfect summer dessert without too many additional calories. At first I thought you were putting ice cream sandwiches into the recipe with the drumsticks, my mind was going crazy! Either way, I hear you on the ice cream sandwiches, the peanut butter variety is one of my favorites! Not only is your chicken looking divine, I didn’t know Skinny Cow made those little sandwiches. Yum!